In stock 842 pcs. Also available in our walk-in store. 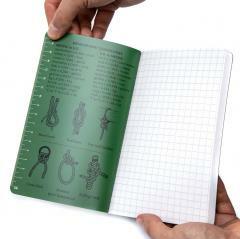 A waterproof notebook made from the byproduct waste of limestone mines. 30 pages. 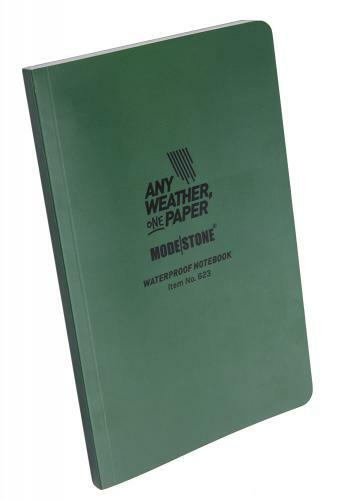 Not only waterproof, but warproof as well - these are much more durable than your regular paper notebooks. There's really no downside in this. Modestone's limestone based paper is pretty neat. In comparison to Rite-in-the-rain this stuff is stronger and absolutely 100% waterproof, you can have a piece submerged for months without it taking any damage! It is also extremely resistant to wrinkling. 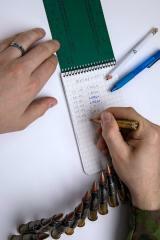 A really neat feature is the fact that on top of the usual pens and pencils you can also use metal such as keys or bullets to write! In all honesty the only downside to Modestone paper is it's slight softness which takes some getting used to when writing with hard tipped pencils. We suggest using a pencil on these. The manufacturer says you can even use something like a key in an emergency, this won't break - and according to our own little tests this statement does hold water. How come they don't make every notebook like this? Dimensions 183 x 118 x 09 mm, size A5. Under the front cover a Metric ruler, knot instructions and conversion chart between the well thought-out Metric system and the obsolete Imperial nonsense based on some Medieval warchief's big toe and nose diameter. 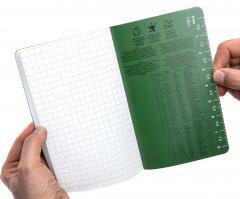 If you still use the Imperial system, just use that conversion chart found in our photos. As said before, these are made of byproduct waste of limestone mines, which means the books are a vulgar display of ecological thinking.